It is hot already and about to get hotter. We’re talking about the weather and also about the premium compact SUV segment in India. Ruling the roost here is an established and popular player called the Hyundai Creta, which is being challenged by the Renault Duster, the Captur, the new Nissan Kicks and even the Tata Harrier and entry-level variants of the Jeep Compass to an extent. More players are about to join this heat in the form of the upcoming Kia SP2i and some variants of the MG Hector too unless the latter is priced higher than expected. Coming back to the topic, there is quite a lot of sharing business which happens between the Nissan Kicks, the Captur and the Duster. They share the same diesel engine and a lot of other components too. However, the Nissan Kicks brings something fresh to the table in the form of segment-first equipment like its 360-degree camera and that floating infotainment screen. In comparison, the Hyundai Creta still remains to King of the Hill for providing features like wireless charging, ventilated front seats, a sunroof (not available on the other 3), and quite a lot of engine and gearbox choices. However, where the Nissan Kicks plays its trump card is by offering a lot of standard equipment on its mid-spec variants, which are substantially cheaper than the Creta. 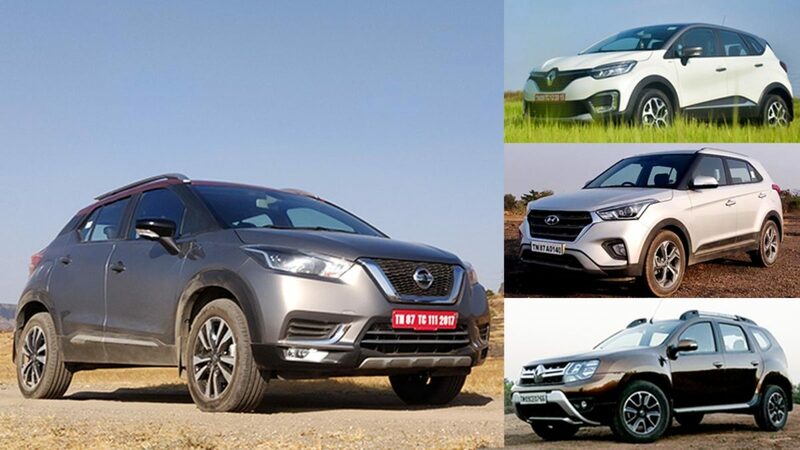 In terms of driving dynamics, the Nissan Kicks and the Renault Duster are top dogs here, while the Creta focuses more on comfort and features. On the other hand, the Renault Captur is a stylish product which also offers many likeable features, but couldn’t gain the popularity of the Duster. Since we’ve driven all of them, it allows us to present our perspective in a balanced manner, where we can compare all four products for their best and not so great qualities, their variant-wise price and everything else a potential buyer would compare before making a choice. The video is in Hindi and an English version will follow. If you have any questions or any feedback, feel free to use the comments section below the video.